Co. Down: Ardglass, Ardkeen, Ballynahinch, Castlewellan, Clough, Crossgar, Downpatrick (3), Dundrum, Dunmore, Dunsfort, Hollymount, Inch, Killinchy, Killough, Killyleagh, Kilmore, Leggygowan, Portaferry (2), Quintin, Raholp, Rossconor, Seaford, Strangford, Tyrella. The Board also included 9 ex-officio Guardians, making a total of 36. The Guardians met each week on Saturday. The population falling within the Union at the 1831 census had been 80,642 with divisions ranging in size from Dunsfort (population 2,009) to Downpatrick itself (6,798). 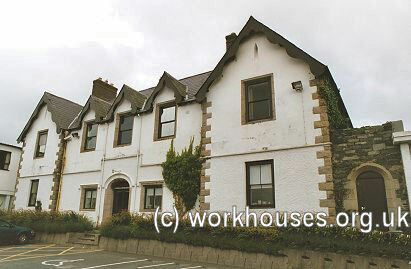 The new Downpatrick Union workhouse was erected in 1840-2 on an eleven-acre site a mile to the north of Downpatrick. Designed by the Poor Law Commissioners' architect George Wilkinson, the building was based on one of his standard plans to accommodate 1,000 inmates. Its construction cost £7,500 plus £2,123 for fittings etc. The workhouse was declared fit for the reception of paupers on 22nd August 1842 and admitted its first inmates on 17th September. The workhouse location and layout are shown on the 1932 map below. The buildings followed Wilkinson's typical layout. An entrance and administrative block at the south contained a porter's room and waiting room at the centre with the Guardians' board room on the first floor above. During the famine in the mid-1840s, a nursery was enlarged to accommodate an additional 20 inmates. Sheds were also provided for 30 fever patients and a fever hospital was also erected. The original workhouse graveyard was located at the north-west of the site. A larger graveyard was subsequently opened a little way to the north of the workhouse. At the 1901 census, the population of the Union was 38,869. 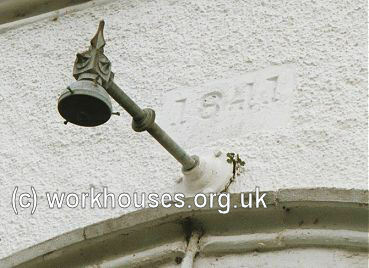 The workhouse entrance block was later used as council offices and the main building as a factory. The fever hospital became Quoile Hospital with the former workhouse infirmary serving as a nurses' home. The entrance block was the sole surviving structure until its demolition in 2013. Public Record Office of Northern Ireland, 2 Titanic Boulevard, Titanic Quarter, Belfast BT3 9HQ. Holdings include: Guardians' minute books (1877-1948); Workhouse registers (1842-1942); Indoor relief lists (1942-5); Indoor Admission and discharge book (1942-9); Master's journals (1937-41); Record of officers (1900-49); Farm account books (1942-8); Sick diet book (1944); etc.